Microsoft Silverlight provides a Downloader object, which represents a set of download functionality for a Silverlight plug-in. Silverlight provides the ability to download content as a package, which is a collection of independent files that contain XAML content, media assets, and other application data. The .zip file format is supported as a download package. The following illustration shows a collection of application content that is contained within a .zip download package. When the package is successfully downloaded, you can use methods such as GetResponseText, SetSource (Image), SetSource (MediaElement), and CreateFromXamlDownloader to selectively retrieve a specific named part of the package. In this case, a part reference is the file name of the individual content within the package, such as "rotation01_green.png". // Event handler for initializing and executing a download request. // Retrieve a reference to the plug-in. // Create a Downloader object. Because the Downloader operates asynchonously, most of the interaction that your code has with the Downloader object will be through event handlers. Typically this involves defining event-handler functions for two Downloader events, DownloadProgressChanged and Completed. The DownloadProgressChanged event, enables you to monitor the progress of the download. One way of responding to this event is to provide visual feedback, such as a progress bar indicator. // Add DownloadProgressChanged and Completed events. // Initialize the Downloader request. // Execute the Downloader request. The following table shows the events provided by the Downloader object. Completed Occurs when the download request has completed and returned content. DownloadFailed Occurs when the download request has failed to return content. DownloadProgressChanged Occurs while content is being downloaded during a download request. The DownloadProgressChanged event is often used with a visual progress indicator, which displays the percentage of content that has been downloaded. 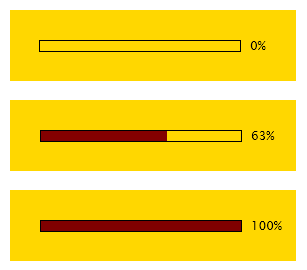 A visual progress indicator can be a simple set of XAML content, such as Rectangle and TextBlock objects, as shown in the following example. // Calculate the downloaded percentage. // Update the Rectangle and TextBlock objects of the visual progress indicator. The following illustration shows the visual progress indicator at the starting, middle, and ending position of the download. A visual progress indicator can be constructed from a wide variety of XAML content, including animated objects. The progress is reported by the DownloadProgress property as a Double value between 0 and 1. // Retrieve downloaded XAML content. Note If you are downloading media assets for use by the Source property of Image and MediaElement objects, you can also use the SetSource (Image) or SetSource (MediaElement) methods. This is a more efficient way to transfer large media assets. ImageBrush also has a SetSource method, and TextBlock has SetFontSource (for collections of fonts). When you invoke the Send method of the Downloader object, you specify a uri parameter that represents the data to be downloaded. The URI property corresponds to the value of the uri parameter of the Send method. The URI property enables you to differentiate downloaded content when you use a common DownloadProgressChanged or Completed event-handler function for multiple Downloader object requests (alternatively, you could differentiate requests by creating separate Downloader instances and event handlers). Instead of returning a string that you process as a single entity, the Downloader can also return a package, which is in the form of a .zip file. To retrieve the content, you write a handler for the Completed event. Instead of using the ResponseText property to retrieve contents, you use the GetResponseText method. GetResponseText has a part parameter, which you specify as the name of the part you want to retrieve from within the package. The CreateFromXamlDownloader method creates XAML content dynamically by using the downloaded content in the Downloader object. If successful, the CreateFromXamlDownloader method returns an object reference, which you can then add to the existing Silverlight object hierarchy. You can create a single Silverlight object, such as a TextBlock, or an entire tree of Silverlight objects. The CreateFromXamlDownloader method is an efficient mechanism for creating XAML objects. In addition to performing the same function as GetResponseText and CreateFromXaml called in sequence, it avoids having to copy downloaded content from the GetResponseText method return value to a temporary buffer and then back again for use by the XAML parser. However, one limitation is that CreateFromXamlDownloader does not expose the CreateFromXaml parameter createNameScope that enables creating the new object with a disconnected namescope. If you need to create objects with a disconnected namescope, you should use GetResponseText and CreateFromXaml called in sequence. For details on why creating a disconnected namescope is sometimes desirable, see XAML Namescopes. // Retrieve the XAML fragment and create an object reference. // Add the XAML object as a child of the root Canvas object. XAML content that is created by using the CreateFromXamlDownloader method is not rendered until it is added to an object by using the Add method. The following illustration shows the relationship between the Silverlight object hierarchy and the downloaded XAML content before and after the content is added to the object hierarchy. // and create an object reference. The SetFontSource method can be used to add downloaded font content to the existing collection of typefaces for a TextBlock object. The downloader parameter identifies the Downloader object that represents the downloaded content. The downloaded content can either be an individual font file or packaged content, such as a .zip file, that contains one or more font files. Note Font files used with the SetFontSource method must be OpenType or TrueType fonts, and must have a file name extension of .ttf. // Event handler for initializing and executing a font file download request. // Retrieve the TextBlock object. // Add the font files in the downloaded object to the TextBlock's type face collection. // Set the FontFamily property to the friendly name of the font. You can also download font files contained in a packaged format, such as a .zip file. The .zip file can contain other content files, such as image files. // Add the font files in the downloaded package object to the TextBlock's type face collection. // Remove the custom font setting. There are two mutually exclusive events that report success or failure of a download. These are Completed (success) and DownloadFailed (failure). Typically you write handlers for both events. The Status and StatusText properties provide the HTTP status code and corresponding text string value that represent the final state of the Downloader object request. Generally speaking, status will always be 200 (success) from the Completed handler and 204 (no content) from the DownloadFailed handler. The Abort method cancels the download request that has been executed by using the Send method of the Downloader object. In addition, the Abort method resets the following Downloader properties to their initial state. // Cancel download on mouse click. // Cancel Downloader activity and restore state. When you call Abort, this does not raise the DownloadFailed event (or the Completed event). The URI that you specify for the first parameter of the Open method will generally use relative URIs. The relative URI will then use the same URI scheme that is used to serve the HTML page, which is generally HTTP. The starting location for the relative reference is the HTML page that contains the current Silverlight plug-in. Setting a cross-domain URI for the second parameter of the Open method is not permitted, and such download attempts will fail. In this case, DownloadFailed does not occur. Instead, a method error is thrown on the Send method call. Because of the cross-domain restrictions on Downloader, if you are setting media or images using URI sources that are cross-domain, do not use the various SetSource methods, because these require a Downloader to process the URI. Instead, set the respective Source properties directly, and specify the URI as a string. The Downloader does not support downloads through the FILE scheme. This may be an issue if you are testing Silverlight-based applications locally in the file system, instead of developing and then deploying your Web site to a test server or to localhost. The downloader will fail against the FILE scheme at the point when you call the Send method. You can use HTTPS as the implied protocol for downloads, but only if the HTML page that contains the current Silverlight plug-in is also HTTPS. Backslashes (\) are not permitted in Downloader URIs; always use forward slashes (/). For more information on Silverlight URI restrictions for Downloader as well as for other APIs, see Silverlight URL Access Policy.